One of the best applications for coatings is in combustion chamber areas. Coating the combustion chamber of a cylinder head can increase performance significantly. In addition, more compression can be run as the proper coating will provide resistance to detonation. Tuning changes can also increase the level of power generated. Coating the intake and exhaust runners can also impact performance. 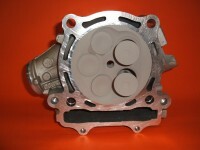 Coating the exterior and the area under the valve cover can improve heat management. By coating the combustion chamber, we reduce the amount of heat that escapes during the power stroke which means more of the heat generated is utilized in “pushing” the piston down. The coating also insulates the surfaces so that they absorb less heat, reducing the load on the cooling system and reducing the amount of dimensional change the head may see from the heat it absorbs. The coating functions in several ways: (1) To keep heat in (Thermal Barrier) (2) To move heat over the surface to reduce hot spots (Radiation) (3) Reflect heat into “cooler” or shrouded areas of the chamber (Convection) and (4) The coating retains less residual heat from combustion than other thermal barriers, thus transferring less heat to the incoming fuel charge (Reduced Thermal Transfer). By transferring less heat to the incoming fuel charge detonation is reduced, as pre ignition which causes detonation, is generally the result of excessive heat absorption by the fuel as it enters the combustion chamber. By allowing the heat of combustion to be more efficiently used, the fuel charge is better combusted, allowing more compression while reducing the fuel quantity need (in most cases) and increasing power. By accelerating the burn rate of the fuel, through better heat management, less timing is needed to have the optimum burn occur at top dead center.